It began like a scene from an urban fairy tale, a perfect, intriguing blend of fear and reassurance. A pretty blond woman, alone late at night, stuck in a car that sputtered to a stop in an unfamiliar neighborhood, approached in the darkness by a haunted face in tattered clothes. No, Johnny Bobbitt Jr. meant no harm, he would later say. The homeless veteran materialized — out of thin air, it seemed — and offered to use the last $20 in his pocket to buy gas for the stranded Kate McClure, to get her away from an I-95 exit ramp in Port Richmond and back to the arms of her square-jawed boyfriend, Mark D'Amico, in their Burlington County home. When McClure, 28, first shared this surprising tale last November, people across the country and around the world felt something flicker in their hearts. It was a reminder, in an age of cynicism and anger and civil unrest, that kindness and decency could still be found, even among perfect strangers at the side of a road. So when McClure and D'Amico created a GoFundMe campaign with the intention of raising a modest $10,000 to help get Bobbitt off the streets, the response was immediate and overwhelming. Whether it was because people felt extra-generous around the holidays, or because they wanted to have a connection to a feel-good story, more than 14,000 donors contributed $402,706 to the account in just one month. Bobbitt's selfless act, and McClure's and D'Amico's well-intentioned response, made them instant celebrities, the subjects of front-page headlines and sought-after guests for Good Morning America and The Ellen DeGeneres Show. Every word of it, from the very beginning. On Thursday, Burlington County Prosecutor Scott Coffina revealed that McClure, D'Amico, and Bobbitt had fabricated the entire Port Richmond rescue scene, and conspired to dupe unsuspecting donors who fell for a charming pitch: Aid a good man who was down on his luck. "They put out a story that hoodwinked a lot of people," Coffina said, adding that GoFundMe had agreed to reimburse all of the donors. The three were charged with theft by deception and conspiracy, and each could face five to 10 years in prison. D'Amico and McClure were arrested and released in New Jersey; Bobbitt was being held in Philadelphia. It was a stunning end to a plot that, according to investigators, was doomed from the start. Johnny Bobbitt and Kate McClure in December 2017. Bobbitt, 35, a former ammunition technician in the Marines, whose battle with drug addiction led to his discharge from the military, drifted from Raleigh, N.C., to Montana before he arrived in the Philadelphia area about two years ago. At some point, he crossed paths with D'Amico, a 39-year-old admitted gambling addict, and McClure at the SugarHouse casino in Fishtown. The couple grew friendly with Bobbitt — fascinated, even. Last October, McClure texted D'Amico that Bobbitt "keeps popping in my damn head today," and D'Amico enthusiastically responded, "Dude I just thought about him!!" They tossed around a number of ways they could help Bobbitt. Maybe they could provide him with food, clothes, and a Nintendo Switch, or help him land a job and find a house. They'd already made a small gesture, giving him $10. In the weeks that followed, they dreamed up something grander. Around dinnertime on Nov. 10, D'Amico took a grainy photo of McClure and Bobbitt at the highway exit ramp where he'd supposedly come to her aid. McClure smiled in the image while Bobbitt stared blankly, his face covered by a wispy beard and dark hood. Within an hour, McClure launched the GoFundMe campaign, which featured the photo of her and Bobbitt, and recounted their unlikely Good Samaritan encounter. She gave the fundraiser a simple title — "Paying It Forward" — and shared it on social media. Almost immediately, McClure was contacted by a close friend, who was incredulous: Why hadn't McClure told her she'd run out of gas in Port Richmond? "Okay so wait the gas part is completely made up," McClure wrote back in a text message, according to an affidavit of probable cause for her arrest. "I had to make something up to make people feel bad … So, shush about the made up part." 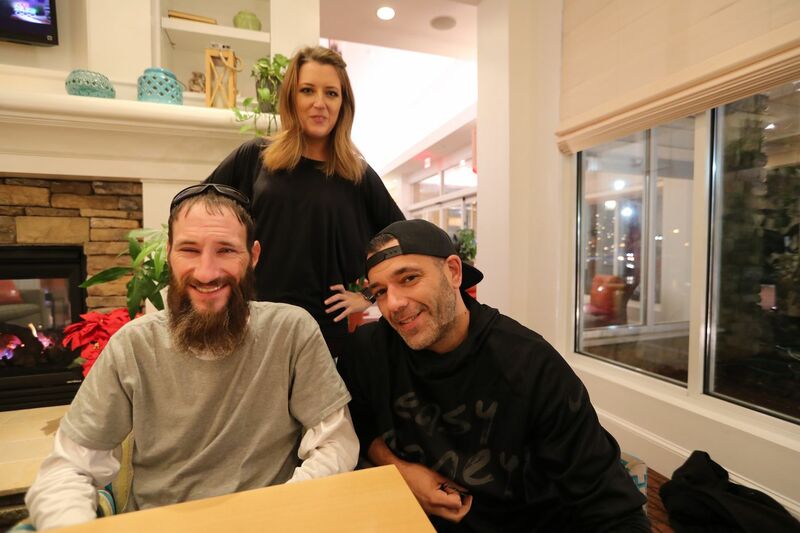 The fundraising drive and its inspiring backstory went viral almost instantly, with news outlets in Philadelphia, New Jersey, and even England posting stories. But McClure's own family suspected something was amiss. "My mom just called me and said that people go to jail for scamming others out of money," McClure wrote to her friend. "…That's what my own mother thinks of me." The friend suggested that "this gas story" would backfire on McClure and D'Amico. "Nah it's all good," McClure insisted, according to the affidavit. "How would it?" Jim Gerrow Jr., McClure's attorney, said Thursday the evidence would show that "Kate only had the best intentions," and that D'Amico and Bobbitt had concocted the plan. Attorneys for D'Amico and Bobbitt could not be reached for comment. As the donations continued to climb, and attention on the trio grew, McClure and D'Amico assured reporters and the public that everything was on the up-and-up. They said they were going to hire an accountant, an attorney, and a financial adviser to create two trusts for Bobbitt, while simultaneously investing some money for his retirement and providing a modest income until he got a permanent job. "We're not angelic people looking for a cause," D'Amico, who described himself as a carpenter, told the Inquirer and Daily News last December. GoFundMe, meanwhile, deposited $347,567 into McClure's bank account, and $19,541 onto prepaid debit cards that were accessible to McClure and D'Amico. What followed was a spending spree that would have been right at home in Martin Scorsese's Casino. McClure and D'Amico took trips to Disney World, Disneyland, and Las Vegas, with a helicopter tour of the Grand Canyon thrown in for good measure, authorities allege. McClure bought a 2015 BMW and $11,000 worth of designer handbags, including some by Louis Vuitton and Coach, and both she and D'Amico had player cards at casinos that included SugarHouse, Caesars, the Borgata, and the Bellagio in Las Vegas. Debit card activity showed online gaming and sports book wagering, too. Some money was sent Bobbitt's way. The couple deposited $31,000 into Bobbitt's bank account. They spent more than $2,300 on several weeks' worth of a hotel stay in New Jersey for him last December, and then bought him a trailer for $18,000, which they planted on their property in rural Florence Township, Burlington County. Behind the scenes, though, cracks started to form. As McClure and D'Amico burned through the GoFundMe money, D'Amico desperately pawned an iPhone, a laptop, an X-Box gaming system and a Movado watch. "I can't believe we have less than 10K left," McClure texted him in early March. The couple often bickered about finances, prosecutors said. McClure, who works as a receptionist for the state Department of Transportation, was paid $43,262 in 2017, according to her state tax returns, authorities said. D'Amico, they said, last filed state tax returns in 2015, a year in which he reported $15,417 in income. There was a chance the three could still pocket another windfall through a deal they were pursuing with a publisher in New York for a book and movie deal. But McClure and D'Amico had grown frustrated with Bobbitt, who continued using drugs and struggled through multiple rehab stints. Bobbitt, in an April interview with the Inquirer and Daily News, seemed unhappy, stuck in a camper on the couple's property, and with a used truck they bought him that had broken down. He wanted to start his life over in Montana, with more control over the money they'd promised him. "At some point," he said, "people have to put trust in me." Burlington County Prosecutor Scott A. Coffina. announces developments in the BCPOâ€™s Johnny Bobbitt, Mark D’Amico, Katelyn McClure GoFundMe investigation Thursday November 15, 2018. Any hope he ever had of seeing more money was moot. As of March 19, McClure's bank account, which had held the bulk of the GoFundMe donations, was in the red. In August, he reached out to D'Amico to express a growing worry that the public would learn of their deception. He and his brother, he said, were ready to get on a bus and leave the area. "I think it's the best idea because we don't want people asking questions," he wrote D'Amico in a message on Facebook. And then he made a choice that essentially assured all three would end up in handcuffs. Homeless advocates in the city put Bobbitt in touch with attorney Jacqueline Promislo of Cozen O'Connor, who agreed to represent him for free — and find out what, exactly, had ever become of the charitable proceeds. "There's nothing to investigate," D'Amico snapped at Bobbitt in a message. In August, after the Inquirer and Daily News reported that Promislo was seeking to recoup Bobbitt's money, the couple responded by claiming that there was still more than $150,000 in their bank account for him. The couple denied spending any money on themselves, except for $500 D'Amico said he'd borrowed from Bobbitt to use at a casino and quickly repaid. Burlington County officials launched a criminal investigation, and searched McClure's home. Privately, she grew concerned that her mother's early warning was true — that she could end up in jail. D'Amico tried reassuring her. "You don't go to jail for lying on TV," he said during one conversation, the affidavit shows. As things began to unravel, the couple inexplicably agreed to appear on NBC's Megyn Kelly Today. They recounted their efforts to ensure that Bobbitt didn't spend the entire windfall on his drug addiction. When pressed by Kelly, they repeatedly insisted they hadn't spend any of the donations on their own purchases. But in the closing moments of the interview, McClure's lips quivered, and she appeared on the verge of tears. "Aw, Kate," Kelly said sympathetically. The camera zoomed in on McClure's face as she explained that she'd received death threats after news outlets reported that Bobbitt had accused them of stealing his money. People only knew one side of the story, McClure said. And then, she doubled down. "I still believe that we did a good thing," she said. "And I would do it all over again. I would do it all over again for him."